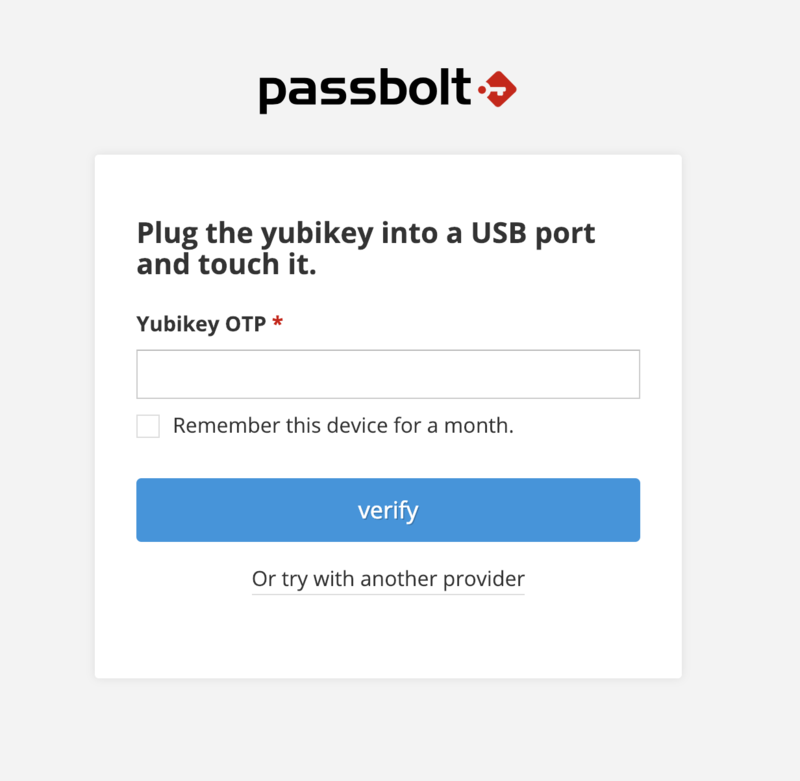 Passbolt Pro Edition since v2.5 supports Yubikey OTP as a multi factor authentication option. Yubico OTP is a simple authentication mechanism that is supported by all YubiKeys out of the box. Important: Multi Factor Authentication is part of Passbolt Pro only and is not available in the Community Edition. 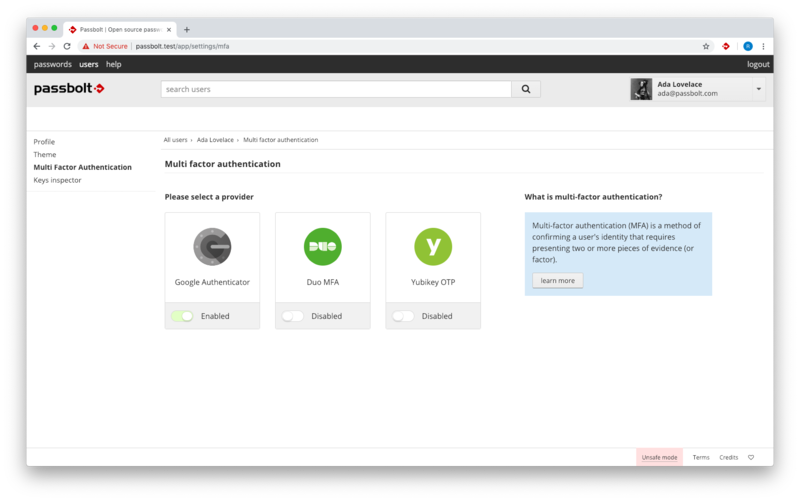 It is important to enable and setup at least one additional multi factor authentication provider in case the user lose its Yubikey or the the Yubicloud service becomes temporarily not available. During a login attempt the passbolt will check if the key ID used by the user is the same that was used during setup. To change key (if the key was lost for example) a user will need to first disable the Yubikey provider in their settings. 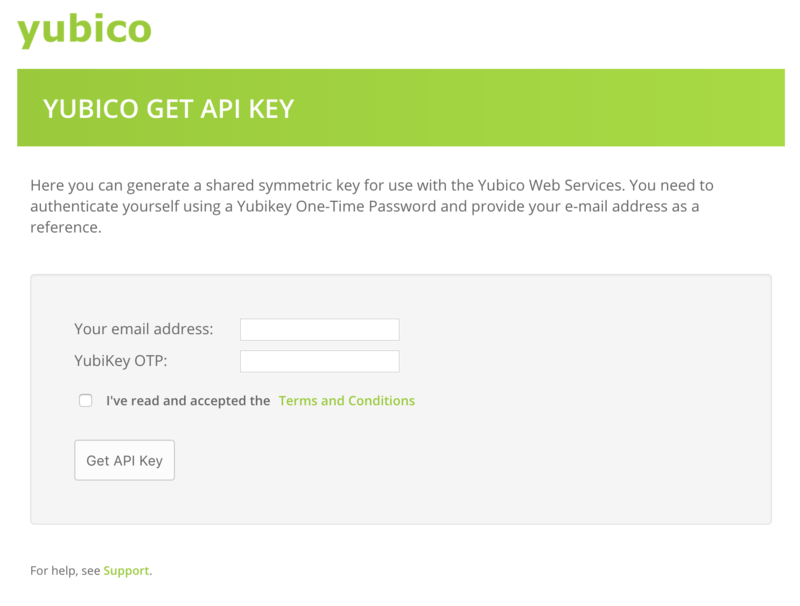 In order to use Yubikey OTP you need get an API key for Yubicloud, Yubico’s web service for verifying OTPs. Please note that while it is possible to host yourself the OTP validation server, this approach is not supported by Passbolt at the moment. Before using YubiCloud, you need to get an API key from upgrade.yubico.com in order to prevent misuse of the service. You will need to authenticate yourself using a Yubikey One-Time Password and provide your e-mail address as a reference, as well as read and accept the terms of service. One or more of these domains may be used to try to validate an OTP. You can either configure Yubikey OTP in passbolt the UI or using files or environment variables. If multiple settings provider are used the settings in the UI will override the one used in files. Similarly The settings in files will override environment variables. Since v2.6 a user interface it provided for administrators to setup MFA providers. Click on “administration” in the top menu, then “multi factor authentication” on the left menu. You can then enable or disable the Yubikey provider by providing the user id and secret key that you gathered in the previous steps. Click “save settings” when you are done. 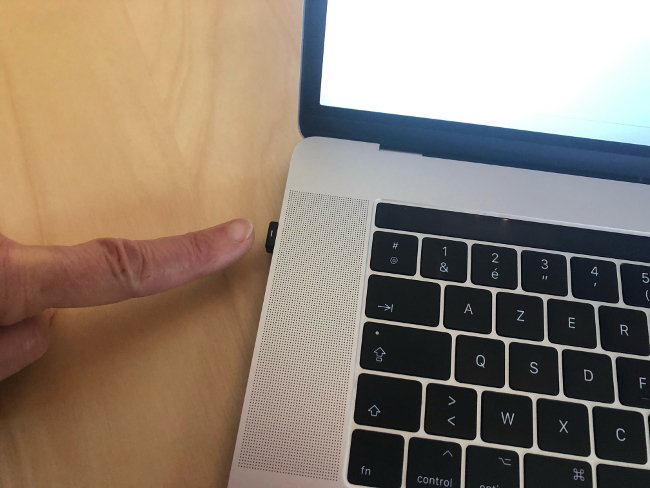 Once you have a the Yubikey integration configured and Yubikey plugged in your computer you can proceed with enabling Yubikey as provider for your user account. It is important you test this to make sure the integration works. When logged in passbolt go to your profile section and click on “Multi factor authentication” in the left sidebar. You should see the list of providers that are enabled for this instance. Click on the Yubikey provider. 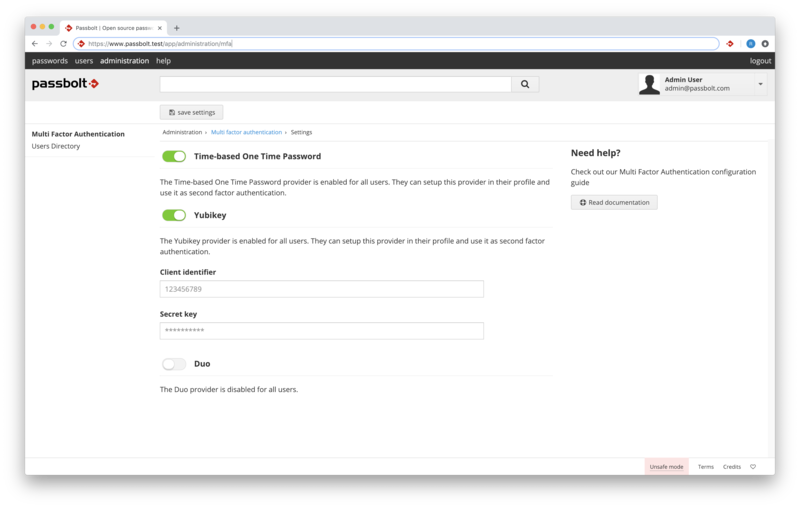 Passbolt will then prompt your to touch your Yubikey to enter a one time password. The next time you try login from a new device, you will be presented with a Yubikey authentication prompt. This article was last updated on November 15th, 2018. Are you experiencing issues with Passbolt Pro Edition?